Going Out In My Mailbag Today: 2 Items! Yep, I finally managed to get these letters done and in the mail today! I actually finished Diana's letter first, but then the day I finished it was when I received Tory's letter in the mail and I decided I could hold off on sending it for a little bit and get them both in the mail on the same day. 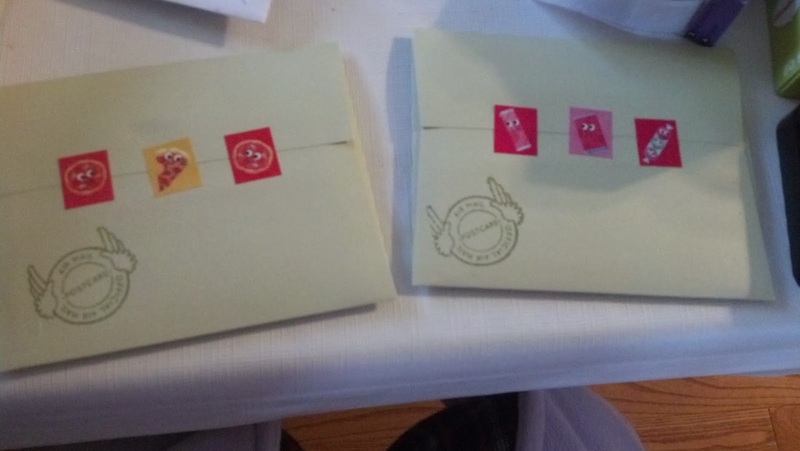 One of these days I might focus an entire post around how I decorate things when I send them off, like with stickers and the countless stamps and inks I have at my disposal. For Tory's card that I stuck her letter in, I just used my scented stickers along with a stamp set I received for my birthday and a type of Distress Ink called Peeled Paint, which is a nice shade of green. I like using stickers and stamps every time I send out a letter (since I can't really use them on my Postcrossing post cards), but I unfortunately don't always have time. I might've done more with these two cards if I hadn't started about an hour before I had to go catch my bus for school. I guess one thing I can say if you're going to be sending out something more personal like a letter or a note card is to make sure you have time to invest to really put the right amount of effort in that you want to. Don't rush it. Items In My Mailbox Today: 2 Items! 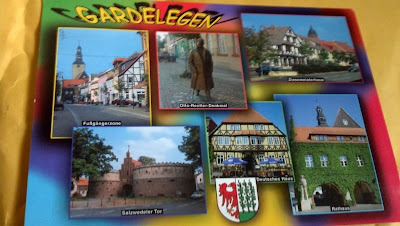 Item #1: Postcrossing Post Card from Germany. My favorite thing about this card is that it's not just a card with images from the country or a major city, but it's all images from the sender's hometown. I appreciate this card so much, because it's so personal, to come directly from a smaller hometown, much like another card I received not too long ago with an illustration from another sender's hometown. I don't exactly know what all the titles underneath each picture translate to in English, but I might ask vlogging iggle Licia, since she knows German and was living there when I first "met" her. 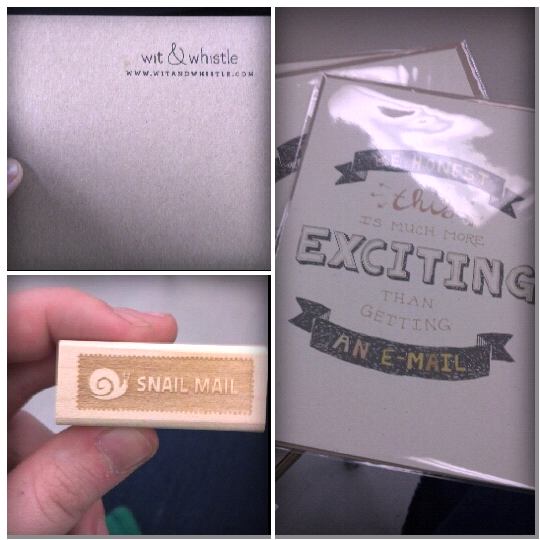 Item #2: Stamp & Greeting Cards from Wit & Whistle. I ordered these items off Etsy, and I was so ecstatic to see this package in the mail just before I grabbed the bus for school! Ever since I first saw that Snail Mail stamp on Etsy, I've been in love with it and wanted it. 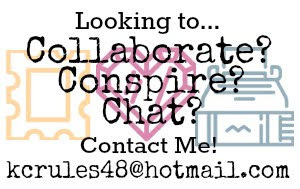 As a matter of fact, for my birthday that passed in August, instead of giving any sort of wish list to my friends that were coming over for my birthday party, I simply directed them to my Etsy favorites list, with much, much emphasis on that stamp. Apparently it was unavailable around the time of my birthday, at least according to my mother. That or it wouldn't have arrived in time. Either way, I am now the proud owner of it :) It felt oddly surreal, taking the stamp out of its cloth bag and physically getting to hold it in my hand as opposed to looking at a picture of it on my computer screen. But the reason that I wanted it so much was because I could so easily picture using this stamp on the front of each and every envelope that I get a chance to send out. It's like I'll be able to better emphasize the whole concept - Snail Mail. I am writing something for you and sealing it into an envelope and stamping it and taking the time to make sure it's delivered right to your door - not to your inbox - and am patient regarding the fact that it will take some time for these words to reach you. The greeting cards that I ordered express this ideal as well. In case it's difficult to read the design on the front because of the lighting at my school and because of the protective plastic over the cards, the cards say, "Be Honest. This is Much More Exciting Than Getting An E-Mail." I ordered and received 3 of them. What I've decided to do is that these are the cards I'm going to be sending to a couple YouTube vloggers that inspire me, that being Superwoman in Canada and Zoella in the UK. I mentioned this little project in a previous blog post, and I had them in mind when I ordered these cards. I won't be sending them out right away though. I happened to order a few stickers off RedBubble, and I plan on sending one to each vlogger. 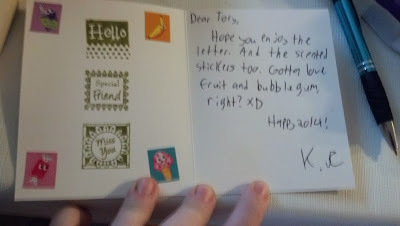 I have one of those intended for my pen pal as well, and will be sending it to her once I get it. In case you're curious who the 3rd greeting card is intended for, I was hoping to send that to a guy I'm currently seeing who can't remember the last time since he received something in the mail that wasn't a call phone bill. In a way, those are the sorts of people I always hope to send things to: People who have forgotten about the joys of letter writing, those who will appreciate the thought put into everything in the sealed envelope addressed to them, and hopefully even those that will take the initiative and send something off in the mail themselves. 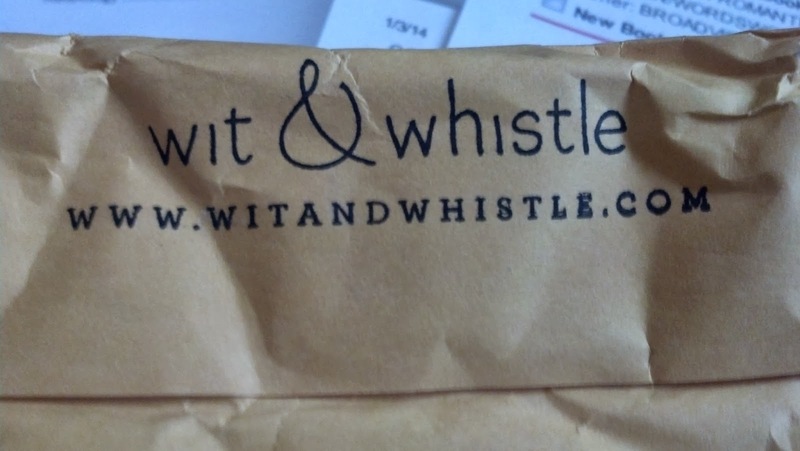 In a way I guess sending things out in the mail can be seen as a way to Pay It Forward. That's all for now. I'll let you guys know when the RedBubble package comes in, and when I get something in the mail next. Plus I'm excited to send something where I'll get to use my new Snail mail stamp :) I'll be sure to keep you all posted. I lovvvve that stamp! Wit & Whistle, you're on my radar, prepare for me to give you all my monies!